Bose System review | What Hi-Fi? Multi-room is no longer in its infancy. Since graduating to big school the good grades are more difficult to attain, and in the playground bruised knuckles have replaced the forgiving touch of kid gloves. It’s not that things were easy before, or that Awards and five-star reviews were previously dished out like lollipops. However, more work than ever is now required to keep up with the leading pack. Though we previously reviewed the two Bose speakers in this test, initially awarding them each four stars, that in itself is not prescriptive. There is no automatic ceiling in place: if those components still stand up to the current market, a feature-laden app and intuitive user experience (along with a talented wireless link) would make it a recommendable multi-room set-up. We start with the SoundTouch 30 Series III. It’s a behemoth in stature, dwarfing the Sonos Play:5 and Bluesound Pulse 2, while retaining its sophistication with minimalist decor and slim-line OLED display. There is also the option of wired internet connection, an ethernet port joining the aux input on the SoundTouch 30’s otherwise near-featureless reverse, and Bluetooth for untethered offline playback. Bose uses what it calls Waveguide technology, effectively performing a kind of traffic warden role in delivering the power of the SoundTouch 30’s two high/midrange drivers and singular subwoofer in a way that belies even its considerable size. Performance aside, there is little else but size to distinguish the SoundTouch 30 from its sibling in this test. As a by-product of its diminutive nature, the SoundTouch 10 carries no display panel, and internet connection is wireless only - but otherwise its functions and features are a match for its heftier relative. There is room for six pre-set buttons on top and, unusually for a £150 speaker like this, it comes with a remote. Again, it's the same as that carried by the SoundTouch 30. There’s not even a huge discrepancy in character to really distinguish these two speakers from each other. As promised by Bose, the scale and power in their presentation is impressive - and there is considerable bass weight, which carries rather more insight rather than the mere warbling hum some rivals mistake for low-end authority. They each time reasonably well, too. Although perhaps not quite as meticulous as Audio Pro’s C-series (the sonic aptitude of which can sometimes make it feel an unfair comparison for a rival), their confident handling of a beat and grasp of rhythm comes closer to it than most others. Dynamic expression is another relative forte, with the SoundTouches having the power to spotlight large-scale shifts - and while neither is exceptionally emotive, they have the subtlety to contour expression well enough to not become tedious. But the SoundTouch 30 loses ground in its inability to improve on certain aspects of the Bose sound present in its smallest relative. Detail levels, for example, are more than adequate for a product the size and price of the SoundTouch 10 - but, though strands are set in greater space, there's no significant increase in insight to be gained from the SoundTouch 30. The slight coarseness to treble frequencies and hardness at louder volumes that prevented the SoundTouch 10 from receiving the full five stars two years ago is only amplified in the SoundTouch 30. It contributes to the latter sounding tonally detached - the evident discord between frequency ranges rankles over time. It isn’t, of course, that the SoundTouch 30’s performance has deteriorated since first we heard it - but greater competition at its price point sheds a more unforgiving light on its shortcomings. Denon’s HEOS 7 HS2 speaker, for example, cannot match the Bose’s gift for timing, but is a more coherent and less fatiguing listen. And neither is able to match the performance of Audio Pro’s C10, nor better its £300 price tag. 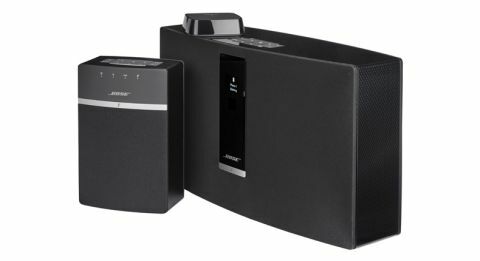 But as with its SoundTouch 10 speaker, Bose is able to exhibit its sonic gift in the performance of the SoundTouch Wireless Link. As far as this aspect of its multi-room set-up is concerned, it is more than happy to give any comparable product a run for its money. Though it houses only one output (3.5mm analogue/digital), it’s unfazed by being paired with our reference hi-fi system, again showing those dancing feet while digging up enough detail and offering sufficient dynamics to make it ideal in a price-appropriate system. The SoundTouch Wireless Link is a true highlight in Bose’s multi-room set-up, with the SoundTouch 10 also deserving of our recommendation. It is only a shame they are restricted somewhat by the company’s control app. It isn’t what the app does which is the issue, rather what it neglects to do. As far as the former goes, ease of use is certainly a forte: pairing is straightforward, grouping components or conversely setting them apart is simple and well synchronised, and it's smooth-running. But there are two main issues here. Functions such as queuing songs and creating playlists – key to the usability of successful systems such as Sonos – are missing, as are some of the major streaming services. The ability to connect to a NAS device easily is a bonus, but one tempered by the omission even of Tidal – surely the most popular lossless streaming service and certainly our favourite. It is a malady likely easily treated, and not one that will be all that off-putting for Spotify users (for example), but one that sees the Bose app the wrong side of the line between uncomplicated and undercooked. In a different era – one not shared with Audio Pro and HEOS, for example – this set-up might fare better. But this is a rapidly changing market in which more and more is required in order to stand out. Sadly for Bose, there are other systems we would more readily recommend.